So, you got a new Chromebook during the flurry of Black Friday/Cyber Monday sales. From the Chrome Unboxed team, great choice and we hope you or the intended recipient are overjoyed with your new Chrome OS device. When the time comes to take the wrapping of your Chromebook, Google has some freebies for you and your new hardware. As usual, you can redeem 100GB of Google Drive storage with your new device if you meet the criteria. Currently, the Chromebook Offers page states that the free storage offer will end November 30th, 2018. I would expect that to be updated come Friday but if you already have your device in hand, no sense in missing out in case that changes. For Pixelbook owners, three months of YouTube TV can be yours at no charge. If you’ve yet to try out Google’s streaming TV service, I highly recommend it and hey, it’s free. You’ll get a great channel lineup and unlimited free cloud-based DVR storage for your favorite shows. If you are one of those lucky shoppers who have a Pixel Slate on the way, Google is offering 30 days of Showtime for new subscribers. Pixelbook owners can snag this one as well but you must redeem before January 19th, 2019. Plenty of time to recover from your holiday. For Chromebooks in general, Google has brought back the exclusive pack for the popular Asphalt racing franchise. The pack includes a free unlock of the Lotus Evora Sport 410, 35.000 credits, 175 tokens and three Premium Card Packs from Gameloft, the maker of Asphalt 9. 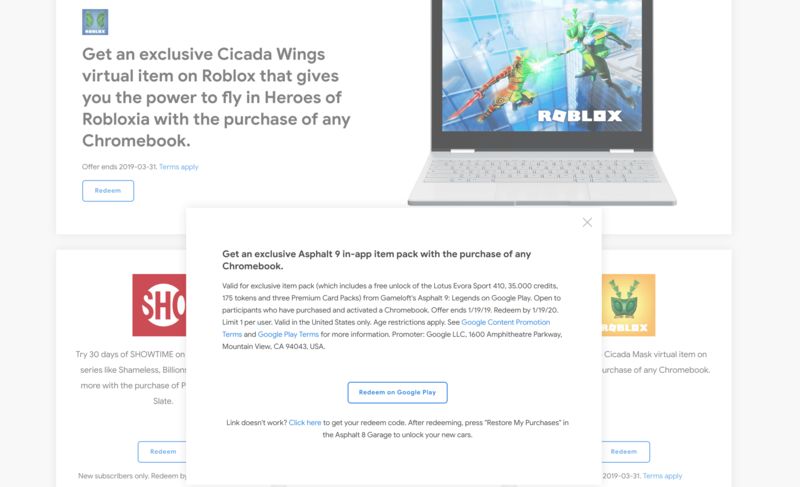 There are also a couple of Roblox offers that will score you a Chromebook-exclusive Cicada Mask and Cicada Wings if you redeem before March 31st. This will be a great one for the kiddos. To claim your freebies, head over to google.com/chromebook/offers.